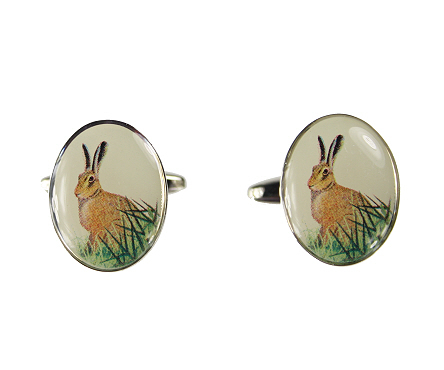 A pair of oval cufflinks with hares sitting in long grass scene. Silver edging and a t-bar fitting. Nicely boxed. One of our 'animal cufflinks' range. Beautiful country tie with leaping hares on a dark green background made from a combination of silk and wool. A pair of cotton handkerchiefs with leaping hare designs in red and white, presented in a smart gift box. An olive green self tie country hares bow tie with embroidered motif. Made in the UK from pure English silk. A beautiful tactile hare ornament in a sitting pose made from cold cast bronze. A beautiful metal hare trinket box (by Hidden Treasures) in light brown enamel with coloured diamanté edging his long ears.